With almost 700 quakes of various magnitudes struck Hawaii's Kilauea Volcano yesterday causing a part of the summit to collapse. A collapse at the summit of Hawaii's Kilauea Volcano on Friday created an explosion equivalent to a 5.2-magnitude earthquake, the U.S. Geological Survey said. The agency said the event created an ash-poor plume about 500 feet into the air. Seismic activity near the volcano has been regular since early May when eruptions first began. 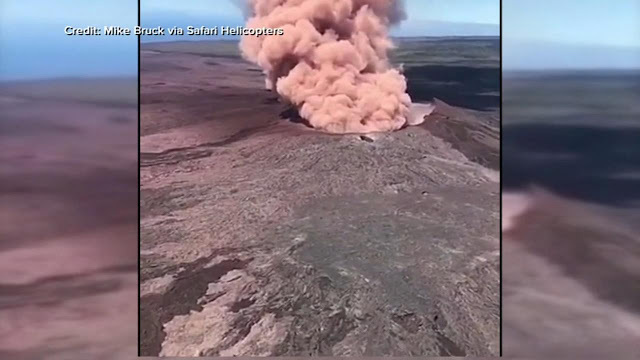 "Following the explosion at the summit, the seismicity will sharply drop off, and then gradually begin to build up as we approach the next summit explosion," Alex Demas, of the USGS, told Hawaii News Now. "So as long as the summit explosions continue, there likely will be earthquakes and ground shaking associated with the explosion." The USGS' Hawaiian Volcano Observatory said Fissure 8 is releasing spatter and causing lava flows into the Kapoho Beach Lots and ocean. The spatter is creating Pele's hair, lightweight, volcanic glass fragments downwind of the fissure. The Hawai'i County Civil Defense said gas emissions from the fissure were "very high." Since the volcanic activity began in April, lava has destroyed 657 homes, mostly in the Leilani Estates and Vacationland neighbourhoods. Some 1,600 households on the Big Island have registered to receive aid from the Federal Emergency Management Agency. In the month of June alone almost 7,000 quakes of magnitude 2.5 or higher have battered the vulnerable volcano.